I have been neglecting this blog recently in favour of building an all-new Web site on another platform. This site will remain as an archive. However, it only seemed right to post today's work here. 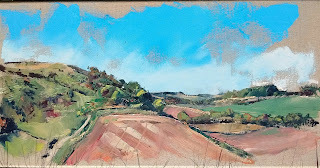 Cannon Heath Down was the subject of eight plein air oils I did in 2011 and 2012. In fact, the first six paintings posted on this blog were all of Cannon Heath Down! 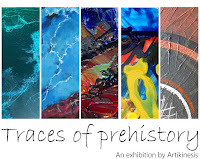 When I set out today, I was expecting to more or less reprise number 7, which I consider to be the most successful of that series (it is currently hanging in the village primary school, I think in the headmaster's office). I had a canvas of a similar size (Cannon Heath Down 7 is 60 x 25 cm; my new canvas is 60 x 30 cm) with me. But when I got there, I was rather taken with the stripey field at the foot of the corner of the down, and decided to make a feature of that. It would certainly help balance the colours nicely (number 7, painted in early spring, was rather dominated by blue and green). I decided that I needed a relatively low vantage point, which in turn introduced a number of awkward foreground trees that cut off my view of The Warren (a hollow to the left of the depicted area) all together (the hollow that can be seen is called Coombe Hole). I'll be reposting all this year's work, including this painting (with a better photograph), on the new site. Watch this space - or look out for a forthcoming post on this blog - for news). Edit: The painting now has a title ("The Vale of Kingsclere") and a post on my new website.